Kranjska Gora is a town in northwestern Slovenia, on the Sava Dolinka River in the Upper Carniola region, close to the Austrian and Italian borders. 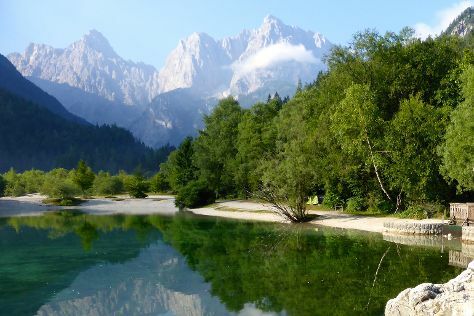 Eschew the tourist crowds and head to Lake Jasna and Vrsic Pass - Julian Alps. Get in touch with nature at Smučarska Šola ASK Kranjska Gora and Intersport Bernik. Explore the numerous day-trip ideas around Kranjska Gora: Radovljica Old Town (in Radovljica) and Kobarid Museum (Kobariski muzej) (in Kobarid). Next up on the itinerary: hit the slopes at Planica Nordic Centre, pause for some serene contemplation at Church of the Assumption of Virgin Mary, appreciate the history behind Statue of Kekec, and try your luck at Casino Korona. For traveler tips, reviews, other places to visit, and other tourist information, refer to the Kranjska Gora itinerary website . Venice, Italy to Kranjska Gora is an approximately 3-hour car ride. Prepare for slightly colder weather when traveling from Venice in April: high temperatures in Kranjska Gora hover around 16°C and lows are around 4°C. Wrap up your sightseeing on the 9th (Tue) early enough to drive to Bohinjsko Jezero. Take a break from the city and head to Mostnica Gorge and Mangrtska Cesta - Die mautpflichtige Mangartstrasse. Explore hidden gems such as Sabotin and Kayaking & Canoeing. Explore Bohinjsko Jezero's surroundings by going to Kojsko (Smartno & Razgledni stolp Gonjače), Denkmal Am Predilpass (in Bovec) and Bjana (in Dobrovo). The adventure continues: head outdoors with Positive sport, don't miss a visit to Monument To Four Courageous Men, and browse the exhibits of Trg Evrope. For other places to visit, more things to do, ratings, and more tourist information, refer to the Bohinjsko Jezero trip planner . Drive from Kranjska Gora to Bohinjsko Jezero in 1.5 hours. Alternatively, you can take a bus. In April, daytime highs in Bohinjsko Jezero are 16°C, while nighttime lows are 4°C. On the 14th (Sun), wrap the sightseeing up by early afternoon so you can travel to Strunjan. Strunjan is a settlement in the Municipality of Piran in the Littoral region of Slovenia.OverviewThe Strunjan Nature Reserve, located along a 4 km stretch of Adriatic coast to the north of the settlement, is the longest section of unspoilt coastline in the entire Gulf of Trieste.The parish church in the settlement is dedicated to the Virgin Mary.EventsSince 2001, Strunjan has held an annual persimmon festival (Praznik kakijev) every November. Start off your visit on the 14th (Sun): get a sense of history and politics at Town Hall, take in the spiritual surroundings of The Cloisters of Saint Francis Monastery, and then have fun and explore at Mediadom Pyrhani. On the 15th (Mon), you'll have a packed day of sightseeing: look for all kinds of wild species at Naravni rezervat Škocjanski zatok, then take in the spiritual surroundings of Church of the Holy Maurus, and then stroll through Svetilnik Beach. Plan my trip to Strunjan with suggested itineraries provided by Inspirock. Traveling by car from Bohinjsko Jezero to Strunjan takes 2.5 hours. Prepare for a bit warmer weather when traveling from Bohinjsko Jezero in April: high temperatures in Strunjan hover around 21°C and lows are around 9°C. You'll set off for Postojna on the 17th (Wed). Kick off your visit on the 17th (Wed): step into the grandiose world of Dvorec Zemono, then learn about winemaking at Petric Winery, and then stop by Gustarna. Here are some ideas for day two: explore the fascinating underground world of Skocjan Caves, explore the fascinating underground world of Divaska jama, then take in nature's colorful creations at Ferrari Garden, and finally learn about winemaking at Wines Jamsek. 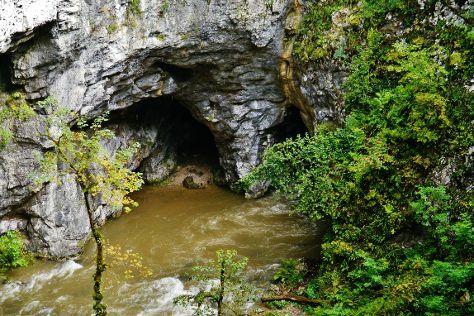 For other places to visit, photos, maps, and other tourist information, read our Postojna tour planner. You can drive from Strunjan to Postojna in an hour. Traveling from Strunjan in April, expect slightly colder with lows of 5°C in Postojna. Cap off your sightseeing on the 19th (Fri) early enough to go by car to Ljubljana. Start off your visit on the 19th (Fri): ponder the world of politics at Town Hall (Magistrat). On the 20th (Sat), you'll have a packed day of sightseeing: make a trip to Mestni Trg, take a stroll through Ljubljana Old Town, glide peacefully along the water with some of the best stand-up paddleboarding in the area, then don't miss a visit to Old Square (Stari trg), and finally explore the activities along River Ljubljanica Kanal. To find where to stay, maps, traveler tips, and other tourist information, you can read our Ljubljana online trip itinerary maker . Traveling by car from Postojna to Ljubljana takes an hour. Alternatively, you can take a bus; or take a train. April in Ljubljana sees daily highs of 19°C and lows of 5°C at night. Wrap up your sightseeing on the 21st (Sun) to allow time to drive back home.